Vidya Balan at the 17th Mumbai Film Festival in a gorgeous orange and green kanjeevaram saree. 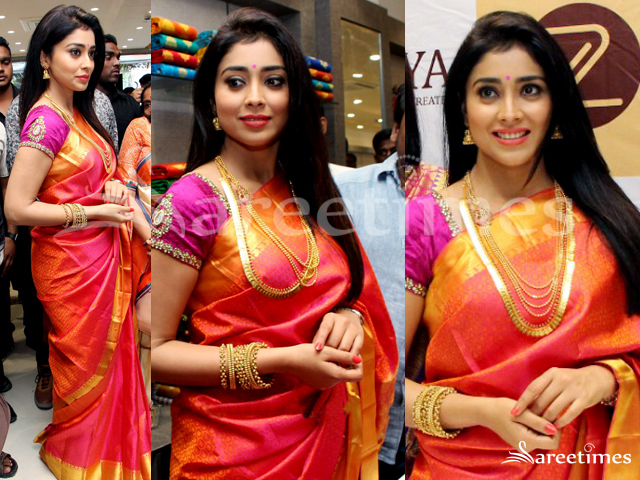 Raashi Khanna inaugurated Vastralakshmi Wedding Mall in Karimnagar wearing a green and gold color kanjeevaram saree, paired with a contrast color short sleeves blouse. Rouble Nagi at her art exhibition in a orange kanjeeveram silk saree. Raashi Khanna inaugurated Kasam Pullaiah store in a blue and gold kanjeevaram silk saree paired with matching short sleeves blouse. Actress Vijayalakshmi with director Feroz Mohammed in a pink kanjeevaram saree. 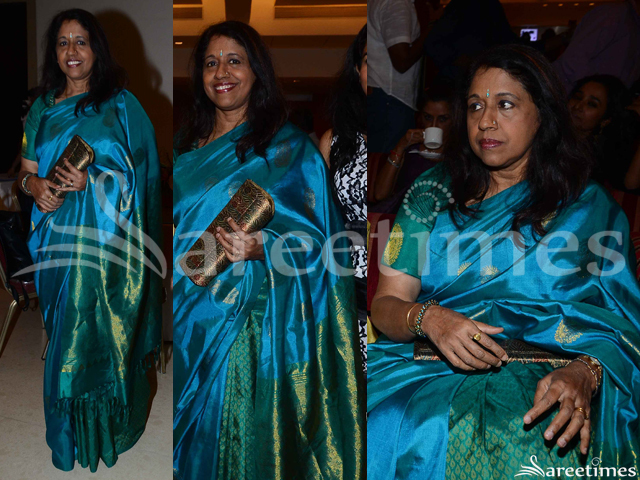 She paired her sarees with elbow length sleeves embellished blouses. 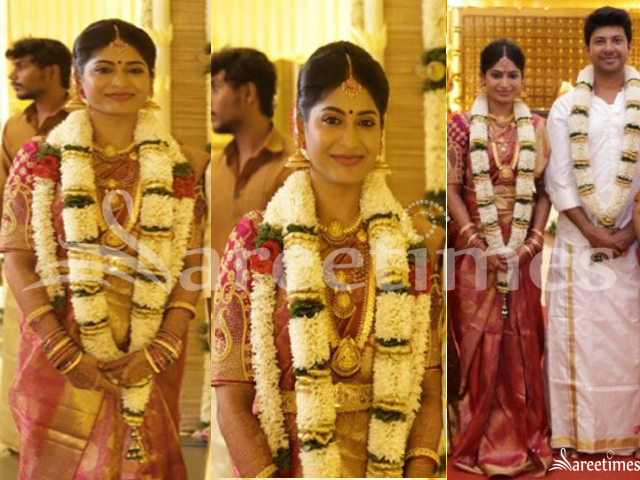 Actress Saranya Mohan got married to Dr.Aravind Krishnan. 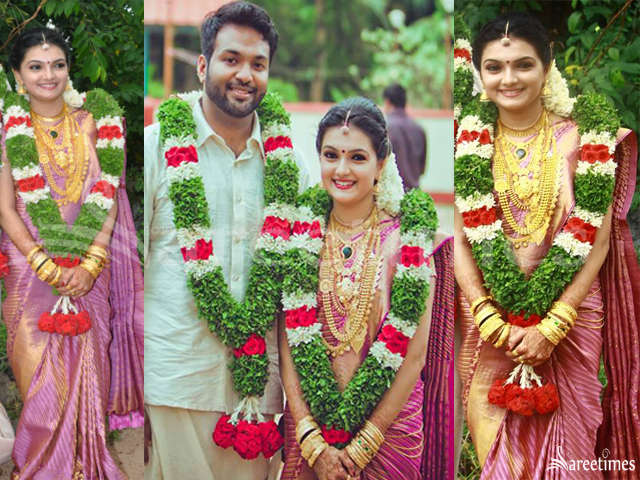 For her wedding Saranya wore a lavender and gold combination striped kanjeevaram saree. Shanthnu Bhagyaraj got married to TV fame Keerthi. The bride Keerthi looked gorgeous in a red and gold combination rich kanjeevaram saree paired with contrast green embroidered elbow length sleeves blouse. 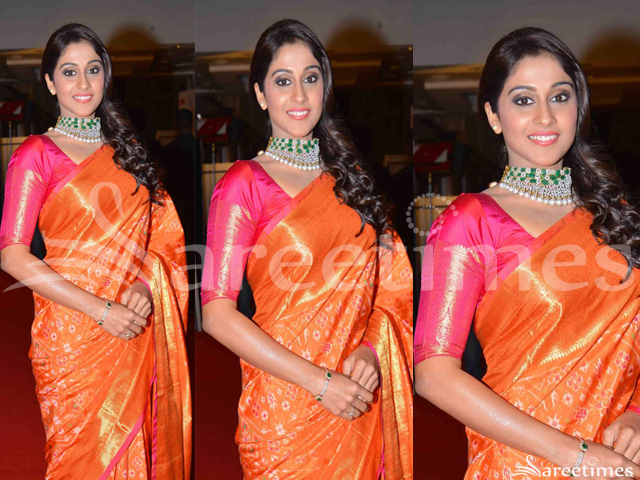 Regina attended CineMAA Awards 2015 wearing Gaurang Shah's orange kanjeevaram saree paired with contrast pink elbow length sleeves round neck blouse. Kriti Kharbanda at Bangalore Fashion Week in a red embellished kanjeevarm saree paired with elbow length sleeves blouse designed by Ashok Maanay. Model Vaibhavi attended a recent event wearing a pink and gold Kanjeevam silk saree, paired with a pink short sleeves blouse. 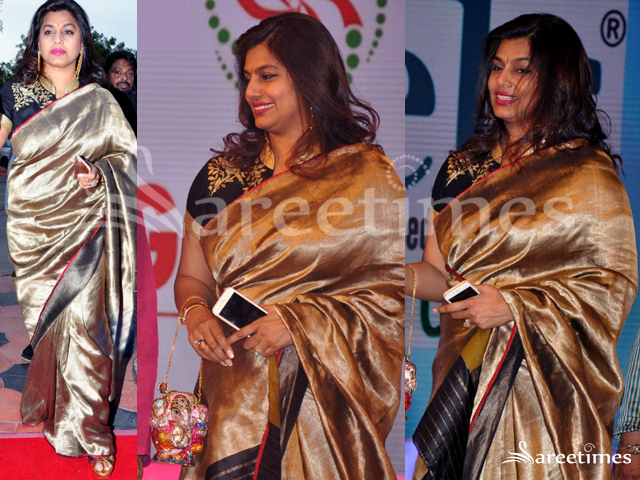 Pinky Reddy at TSR TV9 National Film Awards 2015 in gold plain kanjeevaram silk saree paired with a black short sleeves embroidery work collared neck blouse. 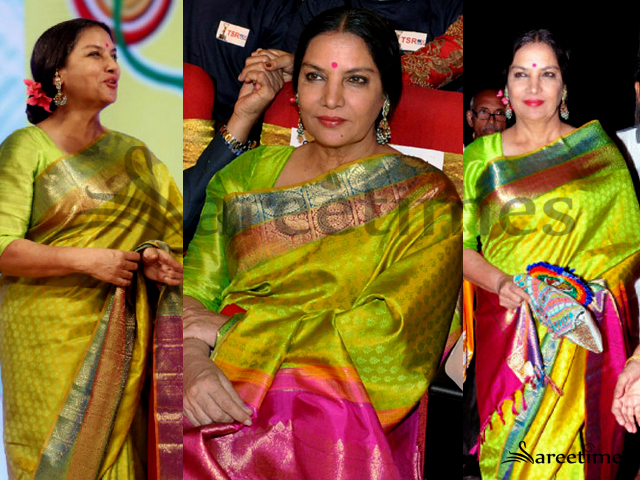 Shabana Azmi at TSR TV9 Awards function in a parrot green color kanjeevaram saree paired with a elbow length sleeves blouse. 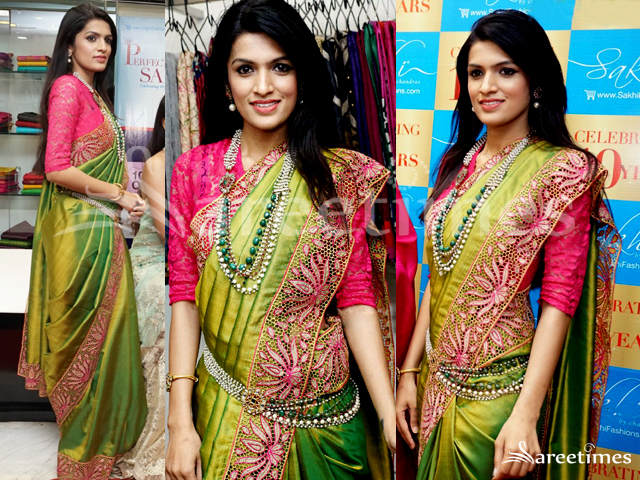 Model Ritu Baridar in beautiful parrot green kanjeevaram saree by Sakhi Fashions featuring lotus design cut work border.